Be the first to share your favorite memory, photo or story of Mary . This memorial page is dedicated for family, friends and future generations to celebrate the life of their loved one. 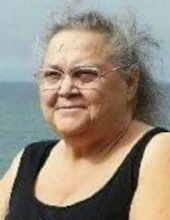 Mary L. Whitmarsh, 71, of Port Byron passed away June 7, 2018 at her home. A celebration of life will be 12-5pm Saturday, June 16, 2018 at Falcon Farms, 2507 214th Street N. Port Byron. Memorials may be made to the family. Quad Cities Cremation Center is assisting the family with arrangements. Mary was born Aug. 10, 1946 in Bemidji, MN the daughter of Lee Stahl and Evelyn Lossing Tuomala. She was raised by her mother and step father Roy Tuomala Sr. Mary retired from Addus Healthcare in the accounting department. She enjoyed baking, crocheting, quilting and everything Betty Boop. Mary loved spending time with her family, especially her grandchildren. Survivors include her children Cassandra Chaney, Leanne (Matt) Minor and Michael Whitmarsh; 21 grandchildren; 37 great grandchildren; 1 great great grandchild; sisters Penny (Jerry) Koontz and Carla Tuomala; brothers Harry (Janet) Stahl, Bernie (Carol) Stahl, Roy (Faye) Tuomala Jr. and Reino (Teri) Tuomala and her angels that provided special care and love, Robert Chaney III and Brookelynn Fentress. Mary was preceded in death by her parents, step father, husband Michael Whitmarsh, sister Ruth and a granddaughter Ann. To plant a tree in memory of Mary L Whitmarsh, please visit our Tribute Store. "Email Address" would like to share the life celebration of Mary L Whitmarsh. Click on the "link" to go to share a favorite memory or leave a condolence message for the family.